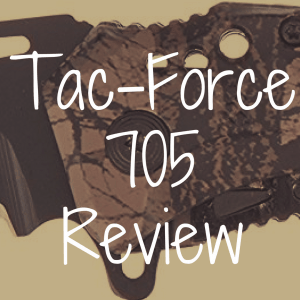 You are here: Home / Pocket Knife / Kershaw Cryo vs. Tac-Force 705: Which is Better? Kershaw Cryo vs. Tac-Force 705: Which is Better? In order to better illustrate this point, I’m going to compare a good assisted-opening knife, the Kershaw Cryo (the G-10 model in particular), to a bad one, the Tac-Force TF-705. 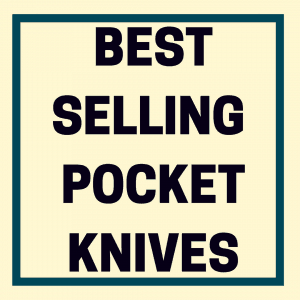 By looking at these two knives and seeing how they compare in each of these categories, hopefully we can come to a better understanding of what to look for in this particular, extremely popular, extraordinarily crowded genre of pocket knife. Below, use our interactive table to directly compare the Kershaw Cryo to the Tac-Force 705 (as well as a few other pocket knives, too). Looking at these two knives, the first thing you’ll notice is their very different visual designs. 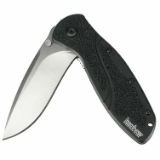 The Kershaw Cryo is designed by Rick Hinderer, one of the most well-known knifemakers of the last few years. It echoes the lines of his XM-18 series without coming across as simply a mass market version of that knife. The handle is simple and straightforward, a fairly generic gentle arc with no fingers grooves or other unnecessary embellishments. Jimping on the spine of the knife and at the base of the handle provide indexing for your fingers, so you always know exactly how you’re holding it when you’re using it. There is a stainless steel version of the Cryo, but I recommend going with the G-10 model; not only is it lighter, but it also provides a little additional grip, which is really useful when you deploy the knife, as a/o knives tend to have a bit of kick to them. Like most of Hinderer’s best designs, the Cryo is simple, and that simplicity does wonders when it comes to ergonomics. The 705, by contrast, is a mess ergonomically. 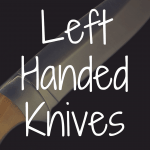 At a basic level its handle is also a gentle curve, but that curve loses most of its effectiveness in service of the ‘technical’ aesthetic of the knife. The skeletal-looking handle sacrifices performance for style. Additionally, there is a cutout at the base of the handle that is supposed to be a bottle opener. This is just a terrible idea, and creates a huge hotspot during use. The Tac-Force 762, not a great knife by any means, at least has the additional tool (a seatbelt cutter) on the back of the handle, where it should be. The handle is all metal too, meaning that, unlike the G-10 Cryo, you may have a hard time holding onto the 705 when you fire the assist. This was clearly a looks-first design, and while there’s nothing wrong with wanting a cool-looking knife, when it gets in the way of its performance as a tool, there’s a problem. Ergonomically the 705 is a disaster. The swedge-heavy Hinderer style is present in the Cryo’s blade, but it isn’t overbearing or detrimental to performance. It is a little stouter than it probably needs to be, but a lot of people prefer their blades thicker, so I can’t fault Kershaw or Hinderer too much for making that choice. In the size category that we’re talking about here the Cryo performs well, if not spectacularly. 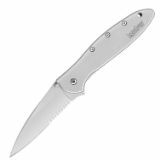 I find that the Zing, another Kershaw a/o knife in this price range, slices better, as does the Leek, but they are less durable. On paper, I like the 705’s blade shape better. In reality, the inept grind means that the blade, which is a good, simple drop point, gets caught in material during use. Grinds and finishes are important, and this illustrates why. The Cryo may not be a great slicer, but it won’t ever get choked up on material the way the 705 will. The partial serrations don’t help here. This may be a personal preference to a degree, but on an EDC knife, serrations are unnecessary and often detrimental for everyday tasks. Why? Well, serrations can cut aggressively, but are not exactly well equipped for delicate tasks. Imagine trying to open a letter with a serrated blade, for instance. You’ll end up mangling delicate jobs with serrations. The tasks that serrations help with, like cutting rope or wood, just aren’t the sorts of things your EDC blade is really meant for. Additionally, when you go half-and-half, particularly on a blade this short, you really are just hampering the performance of both sections of the blade: you can’t do any real sawing with the serrations, nor can you effectively pull-cut with the plain edge. Tac-Force puts serrations on a lot of their knives and, as you can tell, I just really don’t like them. 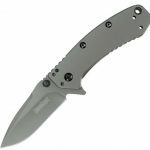 One of the rare Tac-Force knives with a really nice blade is the 762, which has a modified, plain edge clip point blade. It also has a superior handle. For a sub-$40 knife, the fit and finish on the Cryo is excellent. The blade and lock have a clean, even stonewashed finish, all the handle edges are rounded over, and everything fits together without obvious gaps. The quality on some of the earlier, stainless steel Cryos was notoriously bad (as documented somewhat infamously by Everyday Commentary), but when the G-10 version came out a couple years later, both versions seemed much more dialed in. More to the point of this article, the SpeedSafe mechanism (Kershaw’s proprietary a/o system) is very reliable, and unlikely to break, misfire, or otherwise operate incorrectly. Tac-Force puts out knives that give a bad name to overseas production in general. They are universally shoddy, with uneven finishes, poor grinds (as mentioned above), inferior steel, and unreliable hardware. Even amongst the collectors over at Bladeforums, there seems to be little love for them. Although their hundreds of Speedster a/o knives have been around long enough without any serious issues in terms of safety or reliability, I wouldn’t hesitate to say they are generally less well put together than any Kershaw knife. You can feel it in the way the knife locks up (as we’ll discuss below), but also just in the way it deploys. The tolerances are looser. Even on a “good” Tac-Force knife like the 762, you’re getting a product that is poorly put together all the way around. There isn’t a “best” type of lock for folding knife. They all have their advantages (here’s a good introductory overview by Cutlerylover), but as long as the lock works, I’m happy. The steel framelock on the Cryo is excellent. This sturdy lock, along with the tough blade shape, give the Cryo its air of readiness for hard use. In fact, as controversial as it may be, I think this is a better framelock than that found on the Zing or the Leek, and fundamentally as strong a lock as that on the Zero Tolerance 566, the Cryo’s bigger, higher-end brother. The 705 utilizes a liner lock that is pretty bad. There is a ton of travel right out of the box; the liner almost touches the opposite scale, meaning that there isn’t really anywhere for it to go as it wears in. Worse still is that there is a ton of bladeplay in every direction, and not even tightening the pivot will get rid of it all. It comes down to the overall sloppiness of execution. This is not any different from Tac-Force’s other knives. The 762 has the same issue, sadly. There are many reasons why I would advise you to stay away from the 705, but it is the lock issues that make me actively encourage you to look elsewhere. The Cryo costs $30. With regard to other budget knives, this is a little bit pricier than similar offerings, but I think it’s worth it if you like the way it looks. I mentioned the Zing earlier; this is a cheaper, fun, and unique pocket knife, also available in either G-10 or stainless steel, with a (to my mind) better blade shape, and it’s available for less. That being said, I think that $30 is a fair asking price for the Cryo. If you end up getting one, it will serve you well for many years. The 705 is only $10, but I think that when it comes to value you’re still getting fleeced. This is an inadequate knife in every way. Yes, it will cut stuff, and no, I don’t think it will fall apart the first day you have it, but it won’t last long and it won’t ever work as well as you’d like it to. And really, that’s my opinion on Tac-Force knives in general: they are definitely cheap, but they don’t represent good value for your money. 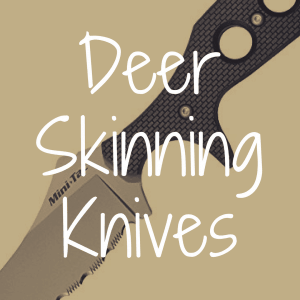 You’re much better off saving up for a Cryo or a Zing, or, if you have to stay in the $10 range, looking at some knives from Sanrenmu, a well-known Chinese knife company that has worked as an OEM for many companies, including CRKT and Spyderco. There’s something seductive about a/o knives. 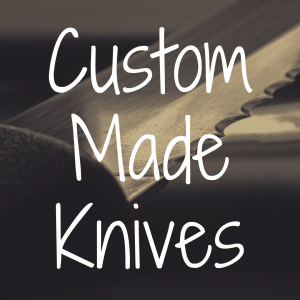 They have a lot of the appeal of automatic pocket knives, without the legal issues that those knives entail. The Cryo, while definitely not the only choice out there, and probably not even my first recommendation for a budget a/o from Kershaw (that would likely go to the Zing), is a great example of the standard of quality you should expect and look for when shopping in this overcrowded segment of the market. The 705, while ostensibly functional on a basic level, and certainly affordable, is just a failure in pretty much every category (at least, every category that I care most about). Its best use is as an example of what to avoid when knife shopping. The phrase “you get what you pay for” is pretty apt here. In short, there’s a lot of a/o knives out there. Hopefully this article will have helped you a bit in your hunt for the next addition to your collection. How to Select My First Pocket Knife? 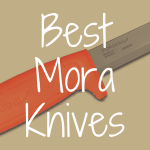 What’s the Best Pocket Knife Handle Material? 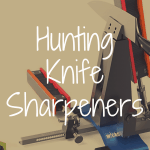 What is the Best Hunting Knife Sharpener?